The poorly executed event doesn't seem to be a mainstay in the NYC festival scene. The first weekend of October is an exciting time - for some of us, it marks the beginning of the Halloween season. For others, it truly marks the beginning of fall. For Queens, this particular weekend marked the inaugural installment of The Meadows Music and Arts Festival. Produced by Founders Entertainment, the same company that has been bringing Governor's Ball to NYC for years, The Meadows was a stab at expanding and solidifying Founders' hold on the festival scene in the city (since AEG Live attempted to touch ground on the East Coast this summer with Panorama). Unfortunately for Founders, they did not do a well enough job to turn this event into a staple. Firstly - the festival took place entirely in the parking lots of Citi Field. Yes, it was held next to Flushing Meadows Corona Park, but not an inch of the festival took place on a meadow, or even a blade of grass. Concrete is not exactly the surface one normally lounges on for a break during a long day of running around and dancing to live music. I only saw one seating area the entire weekend - what kind of planning is that? Secondly, the festival grounds themselves were quite small. All four stages backed up to one another, and attendees walked incircles around them in a very confined space. The amount of festival goers felt like far too many for the available square footage, and was filled primarily by kids who looked under 21. Not my ideal company for a large scale event. Maybe I'm just getting old? Maybe I'm no longer thrilled by the idea of seeing so many artists I like in such a short span of time? Maybe I would rather spend $250 on decent seats to comfortably see Kanye at Madison Square Garden than to spend two days standing outside in rainy weather squashed like sardines by dozens of bros who are rolling face? Chairlift crushed it at 1pm in the afternoon - which is no easy feat as a vocalist. Caroline Polachek's vocals soared with ease and hit the highest of highs, layered atop groovy arrangements. The band's energy was infectious and maintained throughout their set. 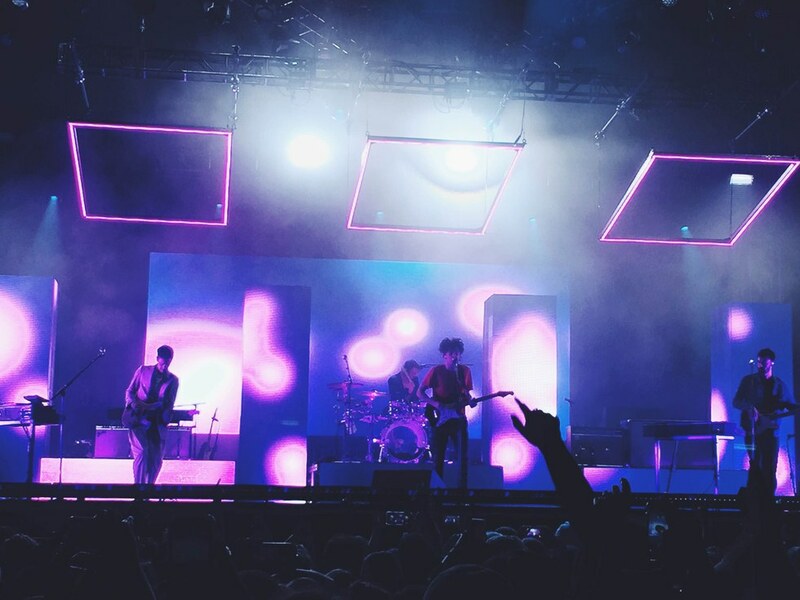 The 1975 played to an incredibly eager audience full of screaming fan girls (myself included). Frontman Matty Healy looked as though he were fronting The Cure, but it absolutely works for the band's pseudo new wave sound. The set was bathed in pale pink and purple lights, and included dance inducing hits and heartfelt favorites, such as "Paris" and "If I Believe You". And last but not least, Kanye. The pop culture phenomenon closed out the festival. He took to the stage 40 minutes later than his scheduled start time - but who would expect any less from him at this point? The set began with fireworks and the infamous floating stage from the Saint Pablo Tour lowered down to the festival main stage. 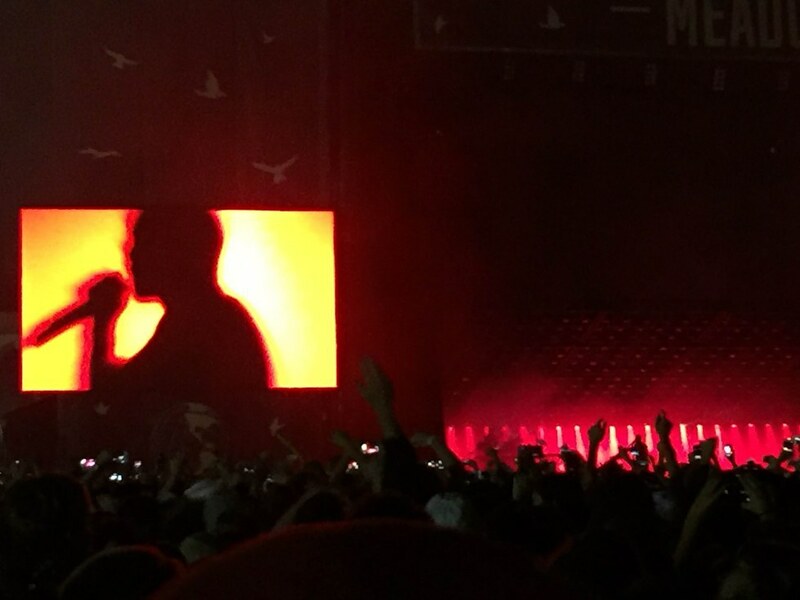 Kanye stepped out and pummeled the audience with hit after hit after hit. The set was incredibly well delivered, and the crowd was eating up every second of it. Unfortunately - the set got cut short after 45 minutes. As you've probably heard by now, Kim Kardashian West was held at gunpoint and robbed in her Paris hotel. Kanye was informed during his set, a few bars into "Heartless", and apologized saying "I'm sorry, I'm sorry.... there's a family emergency, I need to stop the show". It was an abrupt ending that left the audience baffled, but the brief performance we did experience was top notch.